A comedian with a popular anti-corruption message but no political experience took the lead in the first round of Ukraine’s presidential election on Sunday, early exit polls showed, Reuters reported. According to a preliminary exit poll based on votes deposited by 1800 (1500 GMT), two hours before voting closed, Zelenskiy had secured 30.4 percent of votes compared to Poroshenko’s 17.8 percent. 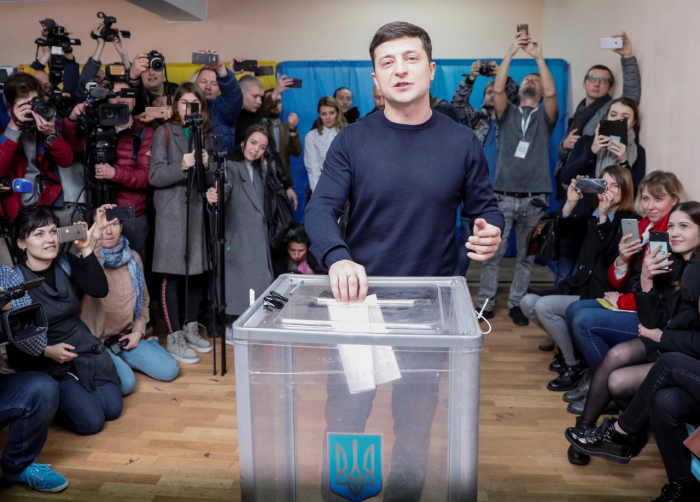 “A new life is beginning, a normal life, a life without corruption, without bribes - life in a new country, the country of our dreams,” Zelenskiy said after casting his vote earlier in the day. After voting alongside his family the incumbent spoke about how a fair vote was essential for Ukraine’s progress. The top three contenders in Ukraine’s presidential elections cast their vote on Sunday in a first round which a comedian - who happens to play a fictional president in a popular TV series - is tipped to win, Reuters reported. “A new life is beginning, a normal life, a life without corruption, without bribes - life in a new country, the country of our dreams,” Zelenskiy said. Zelenskiy has tapped into the anti-establishment mood, though his inexperience makes Western officials and foreign investors wary and skeptics question his fitness to be a wartime commander-in-chief. Voting for the presidential election in Ukraine kicked off on Sunday with a record number of 39 candidates competing for the presidency, Xinhua reported. Some 29,900 polling stations were arranged across the country. They opened at 8:00 a.m. local time (0500 GMT) and will close at 8:00 p.m. (1700 GMT). Ukraine has set up a total of 101 polling stations in 72 foreign states. Ukraine's Central Electoral Commission (CEC) has registered 2,344 international observers from 16 countries and 15 international organizations to monitor the voting process. A total of 134,381 law enforcement personnel have been deployed across Ukraine to ensure the elections proceed peacefully. According to various opinion polls, incumbent President Petro Poroshenko, opposition politician Yulia Tymoshenko and actor Volodymyr Zelensky are so far the front-runners in the race. If none of the 39 candidates gets more than half of the votes in the first round, the two candidates with the most ballots will head to a run-off on April 21. A survey carried out on March 20-26 across Ukraine revealed that 17.8 percent of Ukrainians would support Zelensky, while 11.7 percent would vote for Poroshenko, showing that they are most likely to win the first round. According to a recent survey, up to 85 percent of some 29.8 million eligible voters are expected to participate in the seventh presidential election since Ukraine's independence in 1991. The final results are set to be published by May 4, with the president assuming office no later than June 3.